Trying to decide for the girls. Which would you choose? obviously I'm loving the ruffles. All available here. Turquoise or the yellow flowers. Not loving the middle one. But wow, these are darling!! The turquoise one! So stinkin' cute! I love the first one! Great color and adorable ruffles! I love the fist and third one! Very cute! Turquoise or the yellow flowers. LOVE those ruffles!!! Looks like I'm in the minority but mark one vote for the middle one! Love the retro pattern. oh please pick the yellow flowered one.... so cute! My vote is for the yellow. a or c... love the print and shape for both. b, not so much on either. Ella just got the first one...can't wait until it arrives (Great minds think alike). If Mailee didn't have a ton of ella's old suits I would've gotten her the third one you have pictured...don't tempt me! way cute choices! i'd choose yellow! Ohhh! I LOVE those! 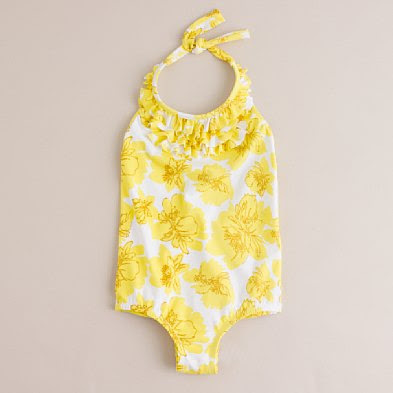 The yellow would look sooo beautiful on my daughter. um...none. why would you pay $40. for a kids swimming suit? The first one is darling! oh so hard to decide I think I like the first one a wee bit more than the third one but those are the top two in my book for sure! The second suit for sure...love the orange accent for a hot summers day. 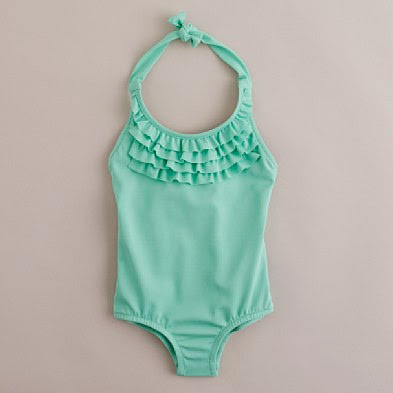 Plus the little ruffles are just adorable.